Anyone looking to take a day trip from Prague should consider Karlovy Vary, Czech Republic. 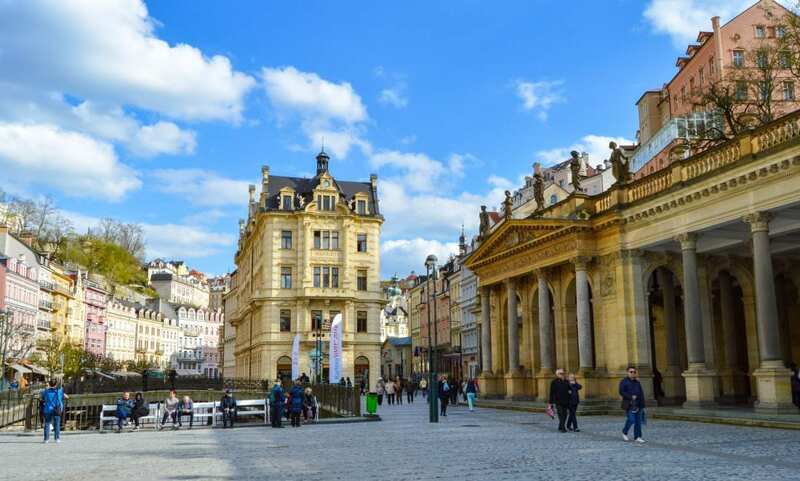 Meet Karlovy Vary, an ideal day trip destination from Prague for lovers of spas, mineral springs, architecture, and relaxation. Located a mere two hour bus ride from the capital, Karlovy Vary is a quaint spa town in the western Bohemia region of the Czech Republic. 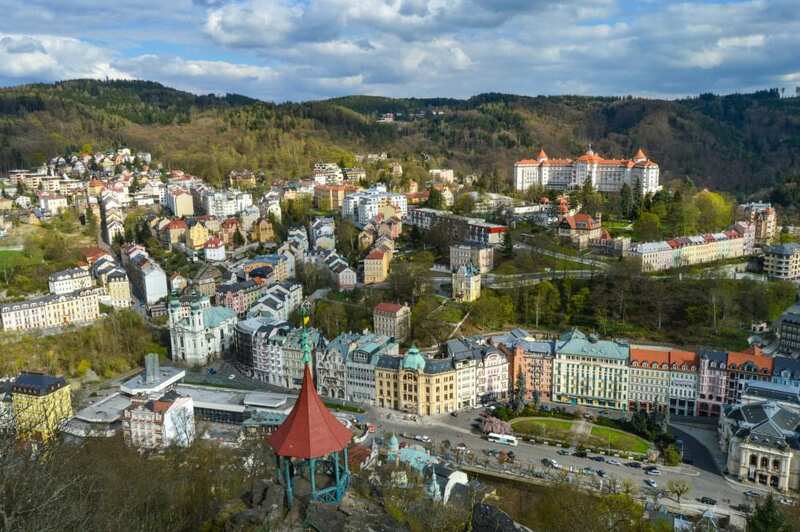 Karlovy Vary has long been famed in Eastern and Central Europe, playing host to countless visitors coming to sample the natural hot springs that run underneath its surface. 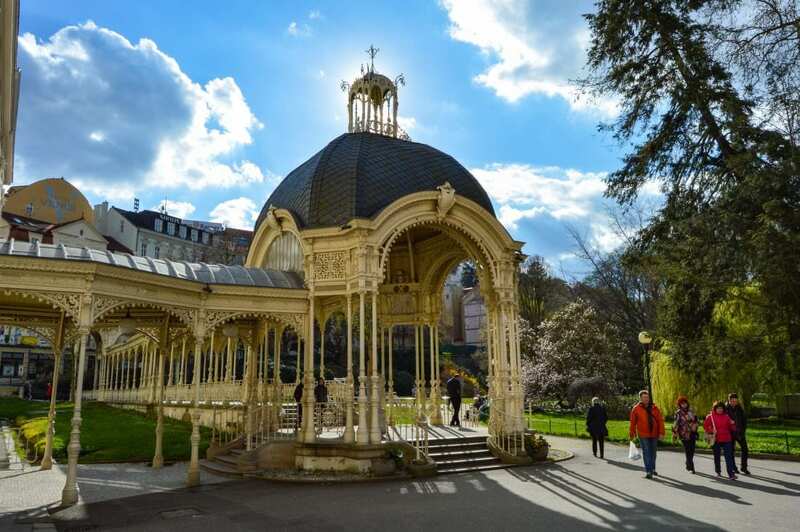 Although most people flock to the town to partake in activities involving its “curative” waters, there is more to do in Karlovy Vary, Czech Republic than just spas and dubious medical treatments. 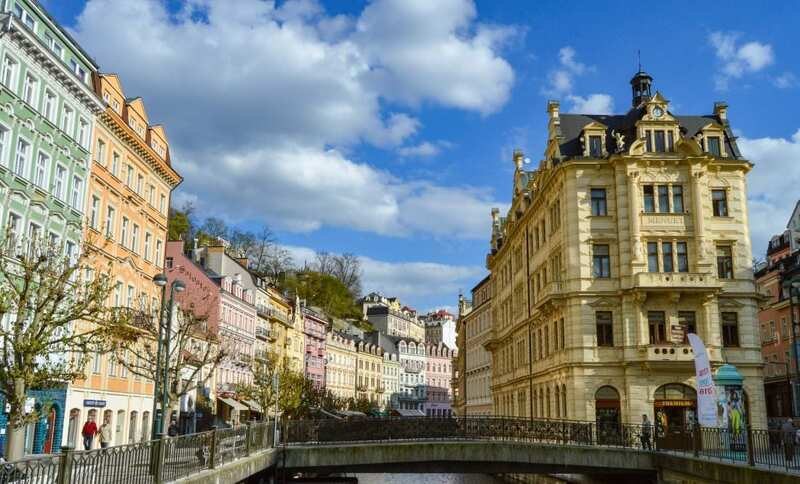 Wander along cobblestone streets to admire the colorful architecture, hit the trails around town to find some lovely views, or pay a trip to a glassworks factory; there are more things to do in Karlovy Vary than first meets the eye. We spent three days exploring the town and created this list of things to do in Karlovy Vary for anyone who wants to visit this gorgeous town but doesn’t plan on spending all of their time in the hotel spa. When we first arrived, we wandered around town for a bit simply taking in all the exquisite architecture. Karlovy Vary was built with a certain flair for glamour, and is extremely pleasing to the eye. Its aesthetic carries a bit of stately pretension, which is something we don’t really like in people, but found charming in this town. It’s hard to walk along the river Tepla (which means “warm” in Czech), upon the cobblestone streets, among the boldly colored Baroque and Art Nouveau architecture and not feel a least somewhat impressed. 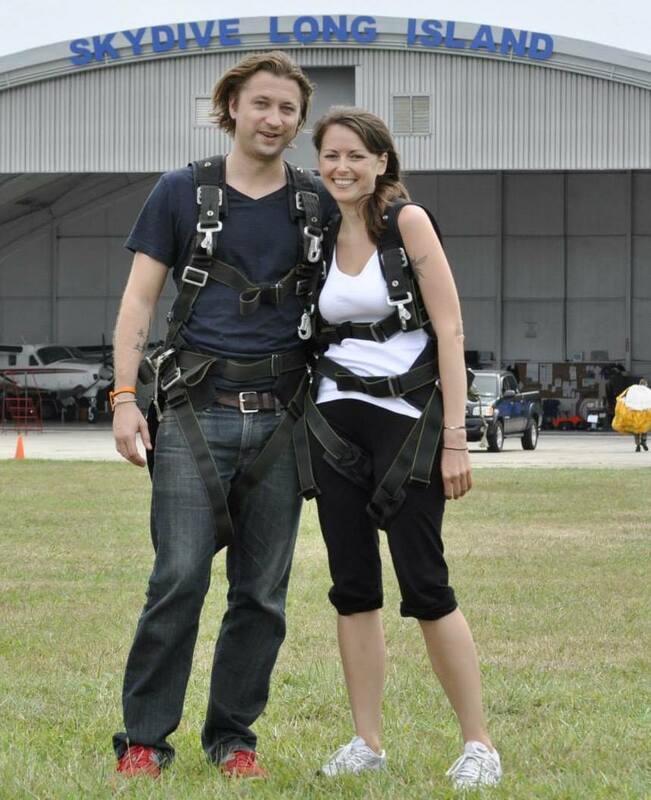 “If only we could see it all from above”, we thought to our ourselves, knowing full well that we could. Thankfully there are plenty of options around town that afford stunning views of the river valley, its inhabitants, and the surrounding landscape. We recommend two, Diana Observation Tower and Deer Leap Lookout. Diana Observation Tower is the highest point in Karlovy Vary at 1800 feet and can be accessed by a lift that ascends every 15 minutes for a stunning birds-eye view of the town. 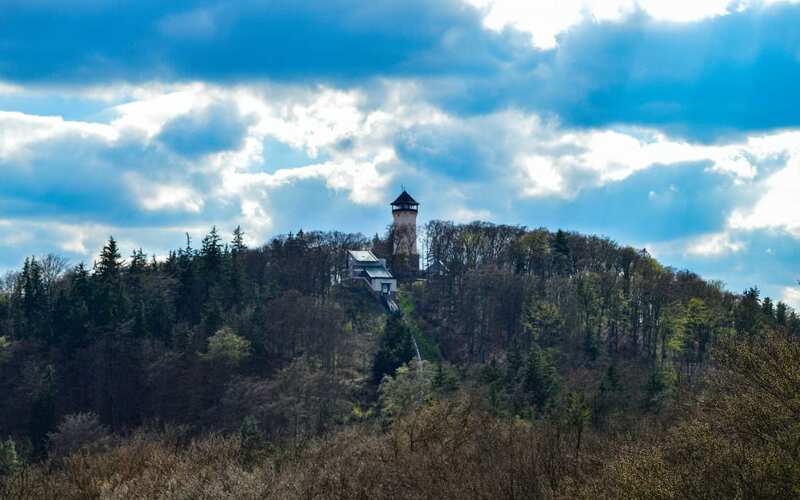 You can access Deer Jump Lookout (Jelení Skok) by walking down from the Diana observation tower. Alternatively you can hike up for about 15 minutes, like we did. The hike is relatively gentle, and suitable for all ages. 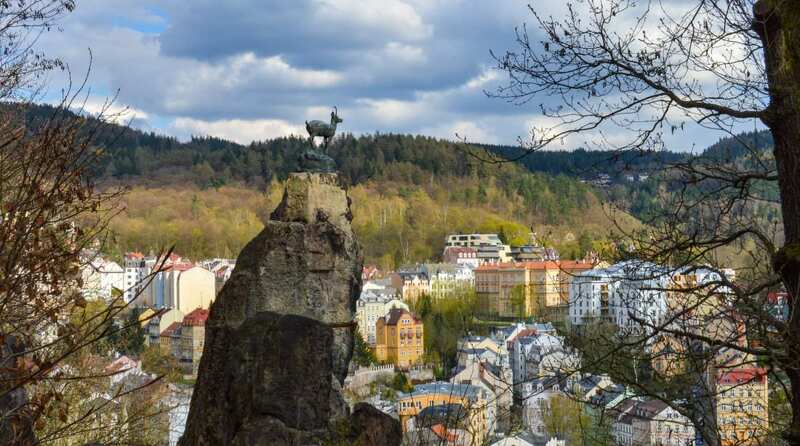 With either lookout point, you can enjoy the beauty of Karlovy Vary from afar and admire her flair. Her joyful color, the hot-blooded Tepla river running through her, the fresh air surrounding her, and the gentle rolling hills gathered round embracing her. 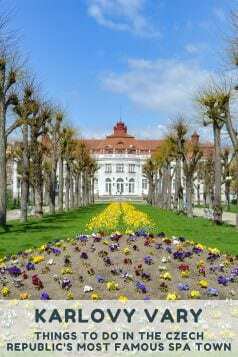 Located next to the Army Spa Institution in Karlovy Vary lies peaceful Dvořák Park. 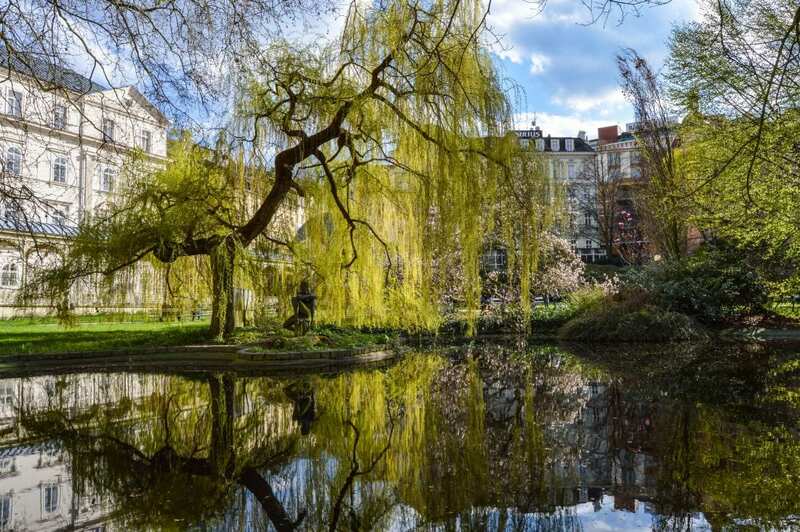 Named after the famous Czech composer Antonín Dvořák, the lazy park is perfect for a quiet stroll or relaxing picnic on a sunny afternoon. 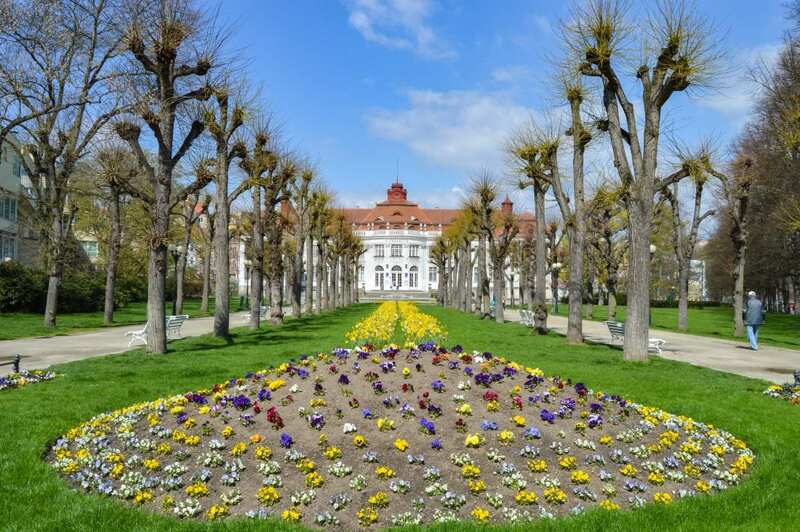 In addition to numerous trees, flowers, and a lovely lake, Dvořák Park is also home to the remains of a Viennese style Colonnade and the Snake Spring (named for the serpentine fountain from which it flows), the Park Spring, and the Freedom Spring. Surprisingly, one of the highlights of our time in Karlovy Vary was our visit to the Moser Museum and Glassworks Factory. 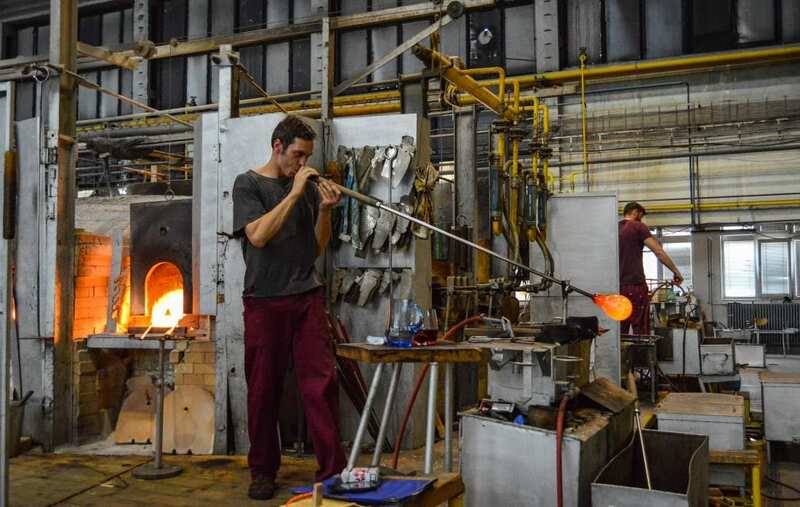 We haven’t had much exposure to the art of glass making, so we were stoked to get a chance to see it first hand. The world-renowned Moser glass, named for its founder Ludwig Moser, is a shining example of the Bohemia crystal the region is known for. 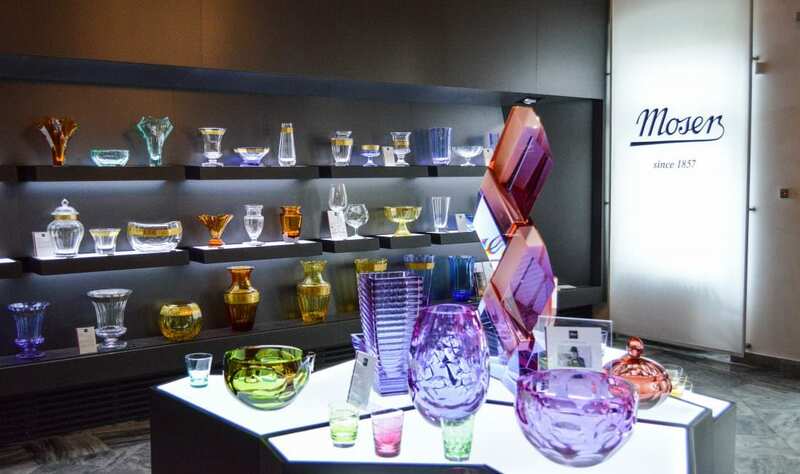 On our half hour self-guided audio tour through the museum we learned about the 150 year history of Moser glass and got a first hand look at a myriad of the companies delicate wares on display. After the tour we were guided through the Moser factory for a fascinating glimpse into how the glass is blown, shaped, cooled, and cut. This was certainly the highlight of our experience at Moser, and probably one of the more interesting tours we’ve been a part of in a long while. Below is a short video we captured of two of the factory’s talented craftsmen making one of their colorful crystal vases by hand. 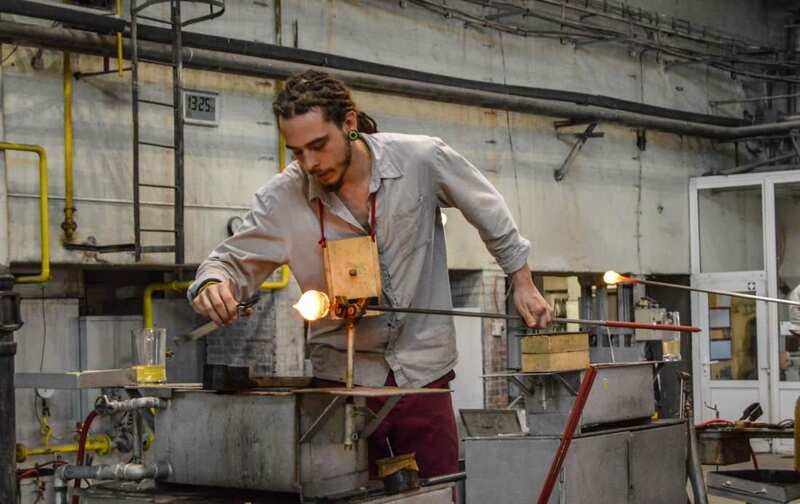 The way these guys handle and shape molten glass is extraordinary. If you have even the tiniest interest in how glass is crafted you owe yourself a tour around the Moser factory. We’ve had no prior experience with glass works, and absolutely loved every second of our peak behind the curtain as the experts did their thing. Take the city bus number 1, 2 or 22 from the bus stop Tržnice (Market hall) in the city center to the bus stop Sklářská Glassworks. The ride takes approximately 12 minutes. Karlovy Vary is home to 13 major and over 300 minor hot springs. People travel from around the world to partake in the curative elements of the mineral waters that flow beneath the town’s cobblestone streets. Thus, it would be unacceptable to visit Karlovy Vary without tasting its mineral water at least once. Before heading out to explore grab a glass or buy one of the porcelain cups that are sold in kiosks around town, fill it up and sip the mineral rich concoction as you stroll around town. The heavy water takes a little bit of getting used to, but once your taste buds adjust you’ll enjoy the extra bounce in your step that you get from Mother Nature’s own (sulfuric) soda recipe. The Mill Colonnade (Mlýnská kolonáda) is the largest colonnade and most iconic structure in Karlovy Vary. This neo-Renaissance beauty dates back to the 17th Century. The building’s porticoes, comprised of 124 columns, provide protection from inclement weather and allow guests to sample the nutrient rich waters flowing from its springs year-round. Don’t forget to look up as you pass by because the building’s roofs are adorned with 12 sandstone figures which represent the months of the year. The Colonnade houses five of Karlovy Vary’s 13 major springs, including the Mill Spring, Rusalka Spring, Prince Wenceslas Spring, Libuse Spring, and Rock Spring, which range in temperature from 133 °F – 149 °F. Don’t forget your cup, you’ll want to sample each one for yourself. 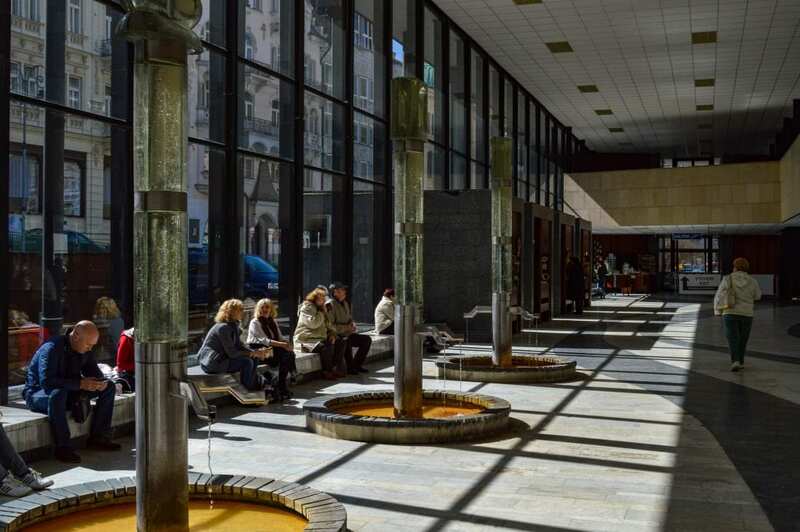 Most of the larger hotels in Karlovy Vary have a spa and offer a variety of treatments and various opportunities to soak in the naturally warm spring waters. However, there are also public bath houses where one can soak their weary bones and muscles. The most well known and beautiful bath house in the town is Elizabeth V Baths. Centrally located in flower adorned Smetana Park, Elizabeth V offers guests a wide range of treatment options including mineral baths, a variety of massages, electro-therapy, heat therapy, hydrotherapy, and even on-site doctors and nurses for medical testing and advice. For more information about the spa, to visit, or to book appointments click here. Built in the 1970s the Hot Spring Colonnade certainly isn’t the most attractive building in Karlovy Vary but it’s still worth visiting. The building is home to the town’s warmest hot spring running at 162° F and a geyser that spurts water 40 feet into the air. Unfortunately, the space around the geyser was under construction when we visited so we didn’t see it for ourselves but can imagine it is quite the site. 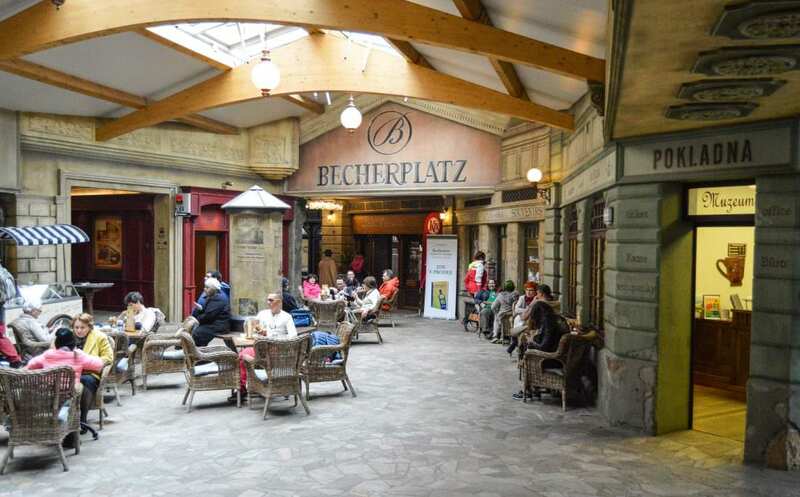 Joking referred to as Karlovy Vary’s 14th spring by locals, and as the “Original Jaggermeister” by others, Becherovka is one of the Czech Republic’s oldest world-renowned brands. We reckon the tour of the Jan Becher museum is worth the price of admission simply for the three shots you get at the end. If sampling different flavors of liqueur is not enough for you, there is some interesting historical context found in the Museum’s presentation. Nothing that will change your life, but a moderately compelling way to spend 40 minutes. Historic Loket, located about eight miles from Karlovy Vary, is well worth the 22 minute bus ride. 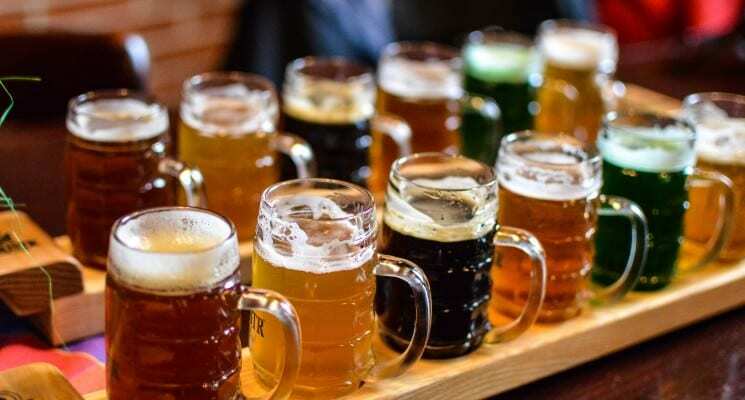 We took a few hours while in Karlovy Vary to visit this pint-sized town, and ended up wishing we had dedicated much more time to it. To call Loket stunning is a bit of an understatement. 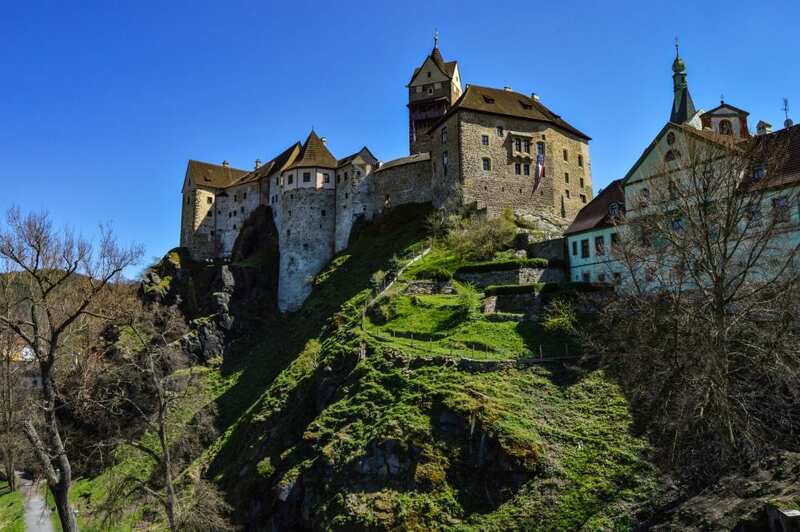 Loket is home to one of the Czech Republic’s oldest castles. Perched atop a hill, making it visible from any direction, the 800 or so year old Gothic structure is perfectly juxtaposed with the brilliantly vibrant and multi-hued buildings that make up the tiny, quite town that is Loket. Be sure to spend some time walking around the town’s narrow, crooked cobblestone streets that wind up, down, and around to discover all of its charms. 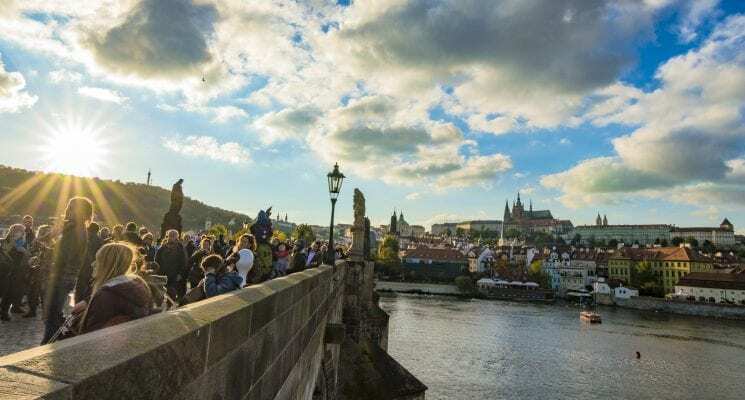 Sip a beer at a local pub, have a Czech meal in a local restaurant, visit the town’s amphitheater while performances are taking place, or hike to the top of the hill near the bus stop like we did for the best views of the town. Buses frequently depart from the main bus station in Karlovy Vary for Loket. The journey is about half an hour and tickets can be purchased from the bus driver for 28 Kč. You can find a daily bus schedule here. Note: When returning to Karlovy Vary from Loket, the bus departs from the station located on the other side of the modern bridge. 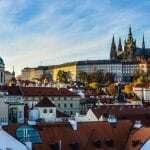 The Karlovy Vary International Film Festival: In July the town is taken over by the Czech Republic’s largest film festival. 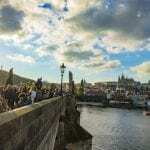 Thousands of cinema aficionados and film fans flock to Karlovy Vary for the festival, to enjoy over 200 new films. We have heard from multiple trust-worthy sources that this is an incredibly fun event, and would love to attend it ourselves one day. 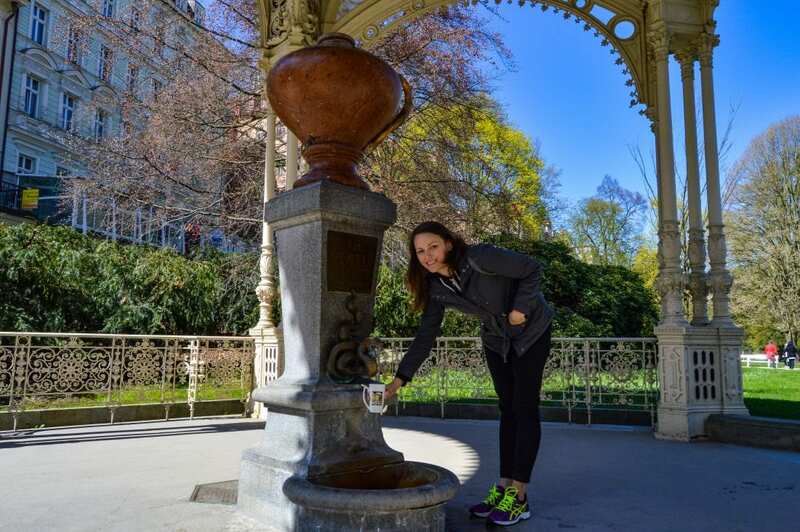 Outdoor Activities: During Summer, Fall, and Spring one can take part in plethora of outdoor actives in Karlovy Vary and its stunning natural surroundings. Rafting, hiking, rock climbing, cycling are all possible for the outdoor enthusiast. Want to see more of Karlovy Vary? Take a look at this short video overview of the town and all it has to offer. If you decide to visit for longer than a day trip, we suggest to following hotels in Karlovy Vary. Pension Napoleon is centrally located and a short walk from the Mill Colonnade. The well appointed apartments include comfy beds, fully equipped kitchens, dining areas, and bathrooms with tubs. The property offers free WiFi, has friendly staff, and offers guests views of the river. Click here to read reviews or to book this property. Penzion Valkoun-Lilienfeld is an excellent budget accommodation option in Karlovy Vary. The small, four room hotel, is located a five minute walk from the Colonnade, is recently renovated, and is elegantly furnished. The staff is super friendly and they serve a fantastic breakfast. Click here to read reviews or to book this property. Hotel Romance Puškin is located in a renovated Art Nouveau building in the spa center of Karlovy Vary. With beautifully appointed rooms, a restaurant offering international and Czech cuisine, friendly and helpful staff, anyone staying at Hotel Romance Puskin is sure to enjoy their stay in Karlovy Vary. Click here to read reviews or to book this property. Note: Special thanks to Czech Tourism for organizing our trip to Karlovy Vary. As always, views expressed are 100% our own. Beautiful pictures! Right now I have this weird fascination with glass blowing, so this would a fun town to see! Not to mention the town is absolutely adorable. It looks like it’s straight out of a fairy tale. 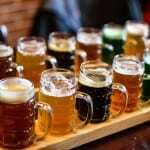 I haven’t heard of Karlovy Vary before but you definitely piqued my interest! Hi Valerie! I can totally understand your fascination with glass blowing. It’s spellbinding! And yes, the town is a bit like something in a storybook. I hope you get to visit it soon!